An Illinois representative’s push to up the minimum amounts of liability car insurance that drivers are required to carry in the state may be dead after the House insurance committee voted Tuesday to not send the measure to the full House for consideration. The bill, introduced by Rep. David Leitch, would have raised total minimums by more than 500 percent. 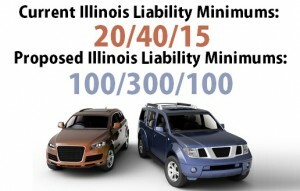 Illinois law currently requires drivers to carry at least up to $20,000 in bodily injury liability for damages to one person, $40,000 to two or more, and $15,000 in property damage–commonly denoted as 20/40/15. Leitch’s bill would have raised it to 100/300/100. It was met with strong opposition from the insurance industry, which said collectively that the higher minimums would bring with them a corresponding increase in the cost of coverage. That in turn, they said, would force some cash-strapped Illinoisans to simply drop coverage and make things more dangerous for other drivers on the road. These arguments from the insurance industry are becoming more familiar as bills to increase liability limits are being introduced in a growing number of states. Wisconsin passed an effort to raise the liability limits last year, but the current legislature appears poised to successfully roll back those changes on the grounds that the change hurt consumers by limiting their options. Bills introduced to the Pennsylvania and Ohio legislatures to increase minimums stagnated in committee, as Leitch’s bill might. And a senator in Nebraska has introduced a bill to double the minimum amount of coverage in his state. At a recent hearing, a member of the coverage industry said that doubling the liability minimums in Nebraska would probably bring about a 14 percent rise in rates for the average family. Texas and Maryland are two success stories in state legislators’ efforts to bring minimum requirements in line with rising medical costs. One thing that sticks out about these two states’ changes is the gradual nature of their increases. Texas used to have 20/40/15 requirements–the same as Illinois. But instead of proposing such a large increase as Leitch has, the Texas legislature voted to raise total liability minimums by only 50 percent and spread the increase out over a number of years. In Maryland, legislators made the small change of going from 20/40/15 coverage to 30/60/15. Leitch’s bill, on the other hand, would raise Illinois’ minimums to the highest in the nation. Currently, the highest state minimum for bodily injury liability is $50,000 for one person and $100,000 for two or more, and the highest minimum for property damage liability is $25,000. Alaska and Maine auto insurance laws require these minimums. 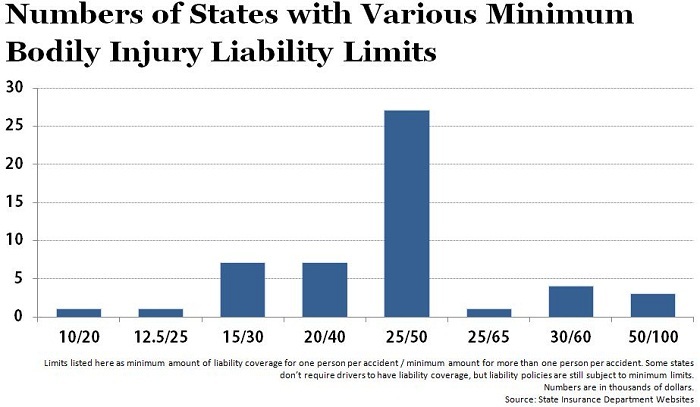 In addition, Illinois would become the only state in the nation to have such a high bodily injury liability limit for two or more people compared to the limit for one person. The only state that has a limit for two or more people that is more than double the limit for one person is Utah, which requires 25/65 bodily injury liability.